Leicester City's remarkable run to the EPL championship is the top story of 2016 in the world of soccer. It was the best sports story of 2016—and perhaps of the 21st century so far. 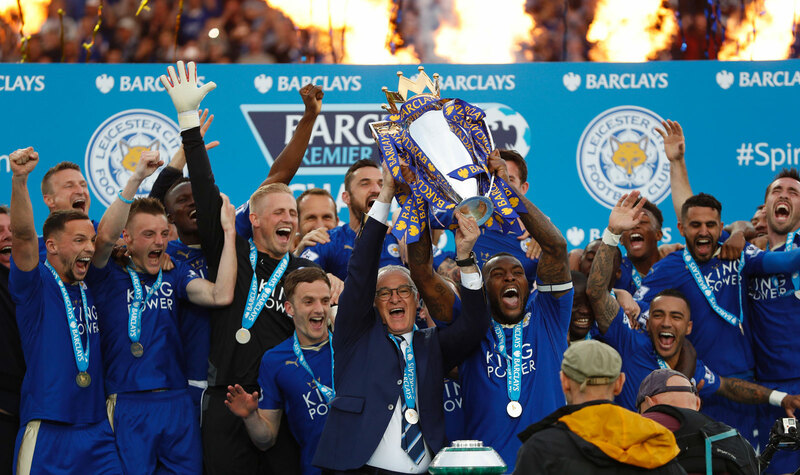 Lightly regarded Leicester City, which had required a near-miracle to avoid relegation from the Premier League in the previous season, was a 5,000-to-1 shot to win the league in 2015-16. Upsets happen all the time in the Premier League when it comes to single games, but the title-winners in the Premier League era over 38 games have always been the wealthiest clubs. 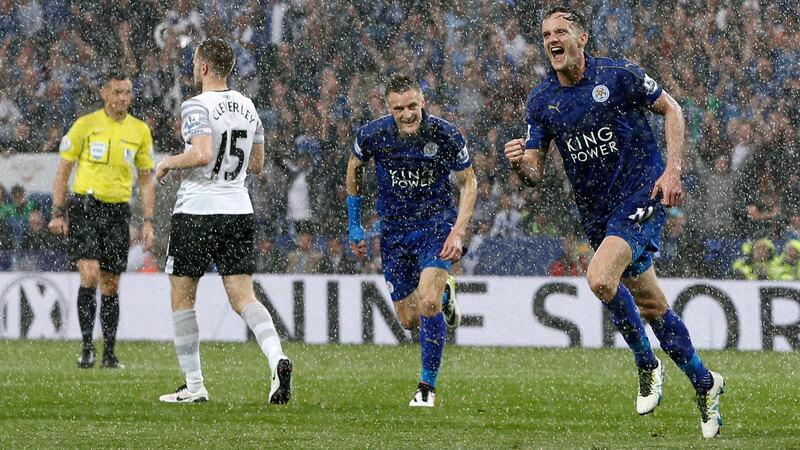 A championship by a team as humble as Leicester seemed unconscionable. Yet somehow it happened. With a mix of talent, chemistry and sound counter-attacking strategy, Leicester made a run for the ages. Jamie Vardy, who had been playing in semipro leagues only a few years earlier, became one of the most reliable goal-scorers in the Premier League. Riyad Mahrez turned into a lethal attacking threat, while N’Golo Kanté established supremacy covering acres of space in the midfield. First-year manager Claudio Ranieri, a genuinely nice Italian man, finally won a trophy by showing restraint in the changes he made to a team nobody expected to challenge for the top. 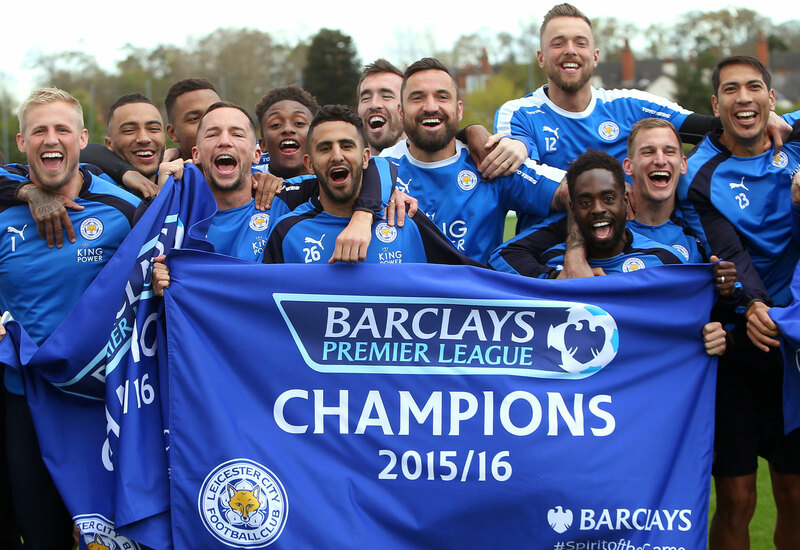 Leicester City players hold up the banner that says it all: The Foxes are Premier League champions. Chelsea fans at Stamford Bridge show their support for Leicester during the Blues' decisive 2-2 draw vs. Tottenham that clinched Leicester's title. Fans celebrate as Chelsea's draw with Tottenham secures Leicester's Premier League title. 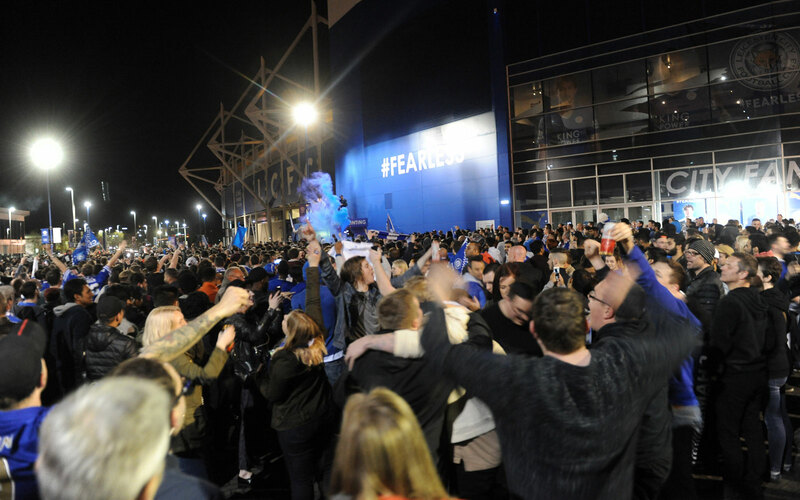 Fans celebrate Leicester's title outside of King Power Stadium the night the trophy was clinched. More Leicester fans express their joy after winning the title. 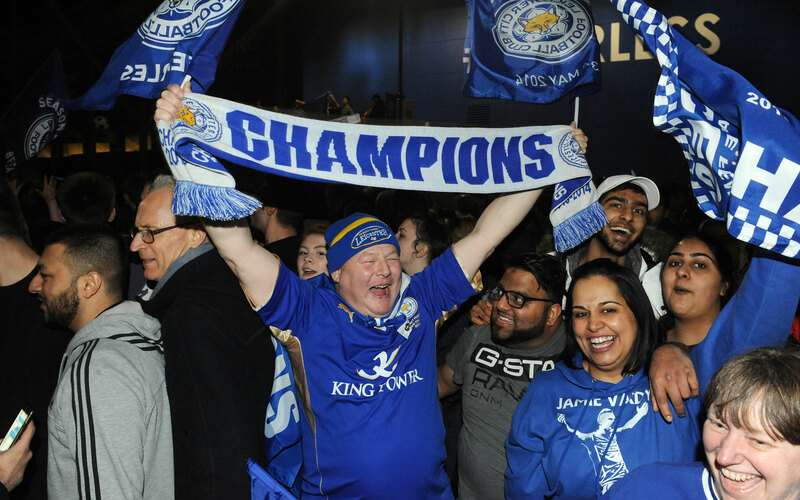 Leicester fans stand outside of King Power Stadium with a trophy of their own–a placeholder until captain Wes Morgan is presented with the actual trophy. A statue of King Richard III, whose tale and reburial is part of the Leicester title lore, is graced with a Leicester City championship flag. 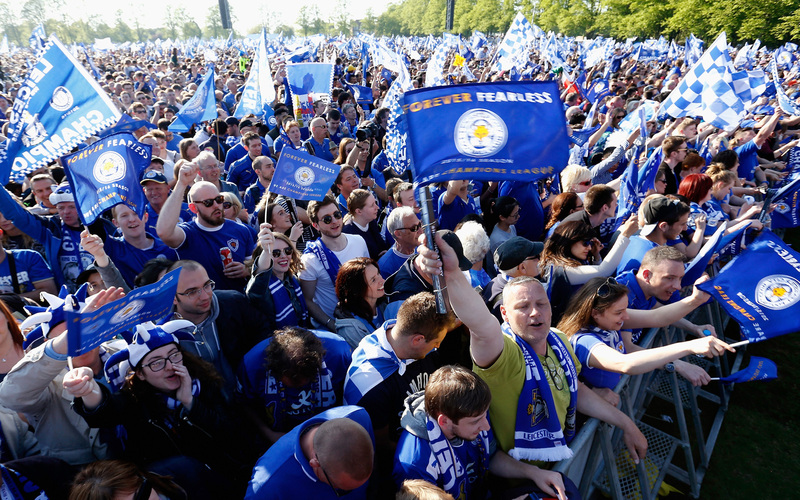 The day after Leicester won the title, fans continued to celebrate by King Power Stadium. Jamie Vardy is escorted through a crowd of fans as he joins a team lunch in Leicester the day after becoming a Premier League champion. Which one is Jamie Vardy? The Leicester forward and his lookalike Lee Chapman celebrate on the team bus. 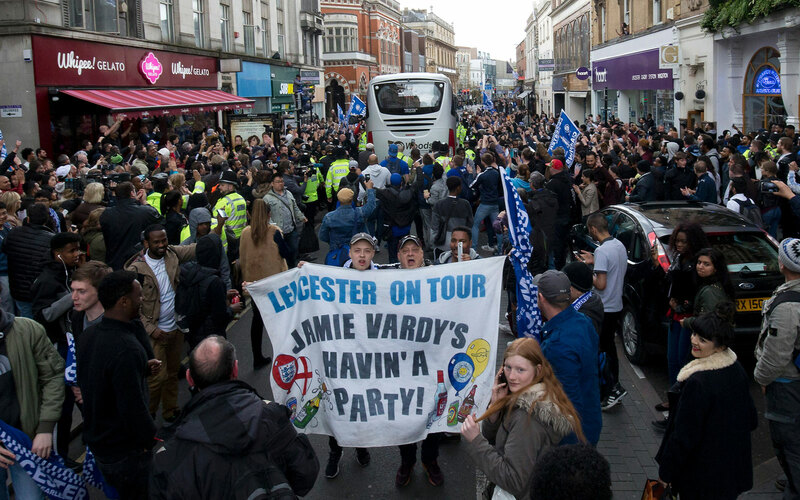 Leicester fans gather to catch a glimpse of Jamie Vardy and the rest of their title-winning heroes. Riyad Mahrez makes his way to a car leaving a team lunch in Leicester, as a mob of fans and media try to catch a glimpse. Leicester manager Claudio Ranieri makes his way through the masses. Even the dogs are behind the Foxes amid Leicester's title run. Leicester City fans Sarah and James Robinson have named their daughter Olivia-June Claudia Robinson–with the middle name in honor of Leicester manager Claudio Ranieri. Claudio Ranieri toasts over Champagne at his first press conference after Leicester clinched the Premier League title. Leicester's Christian Fuchs poses with the UFC title belt as part of Leicester's title celebrations. 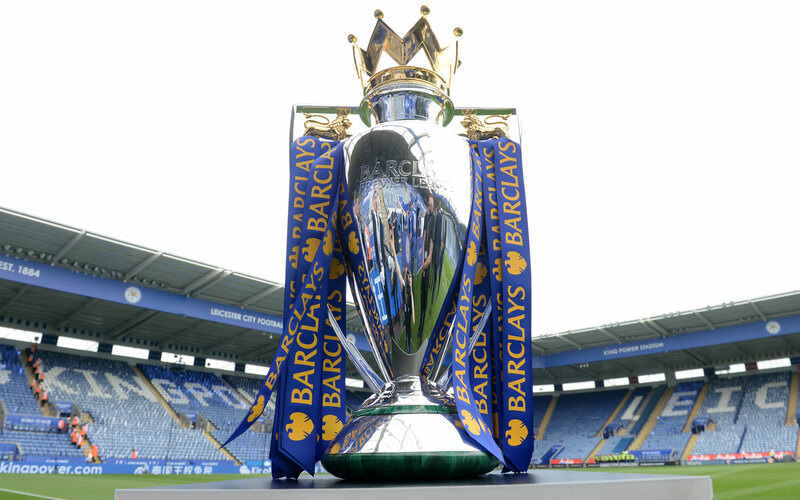 The Premier League trophy arrives at King Power Stadium, where it now belongs. 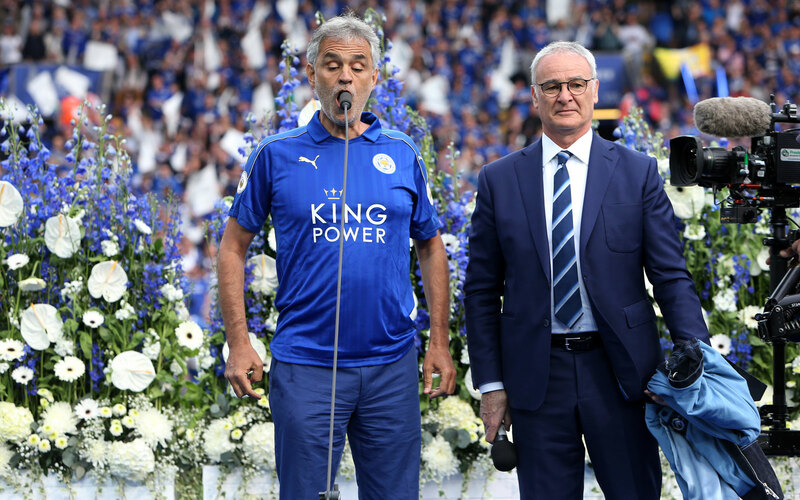 Famed tenor Andrea Bocelli appears on stage with Claudio Ranieri to sing ahead of Leicester's match vs. Everton as part of the title celebrations. 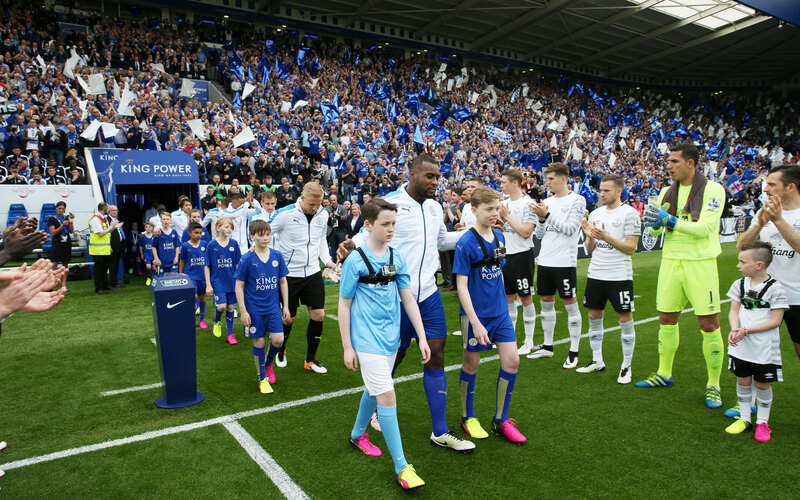 Everton provides a guard of honor for Leicester City ahead of their match. Jamie Vardy wastes no time in marking his return to Leicester's lineup after a two-game ban, scoring five minutes in to keep the celebration going on the field. Andy King, the last holdover from Leicester's third-tier, League One club in 2008, celebrates his goal vs. Everton in the pouring rain. 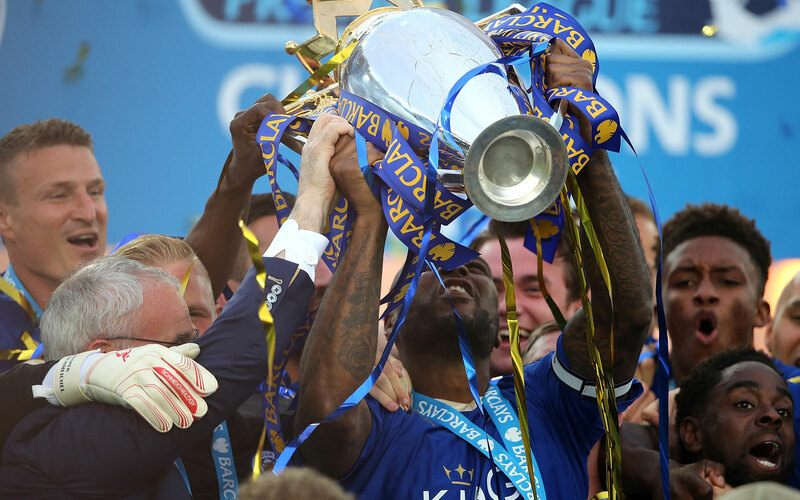 Leicester captain Wes Morgan lifts the Premier League trophy at a capacity King Power Stadium. 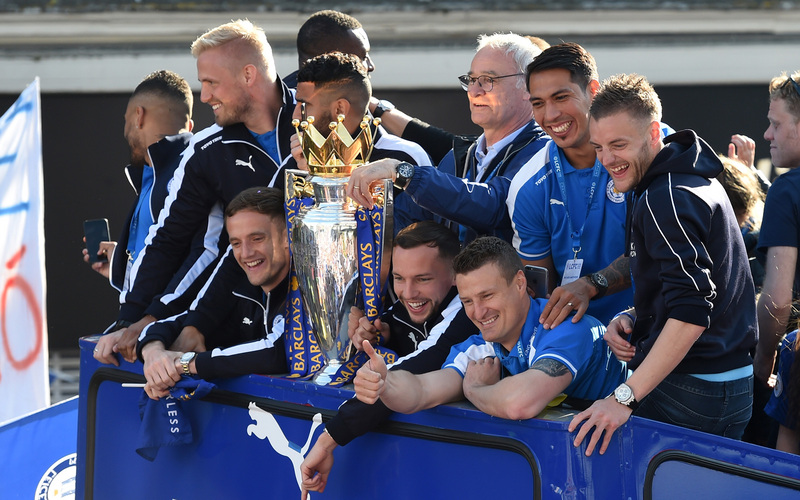 Leicester City lifts the trophy: The 2015-16 Premier League champions. 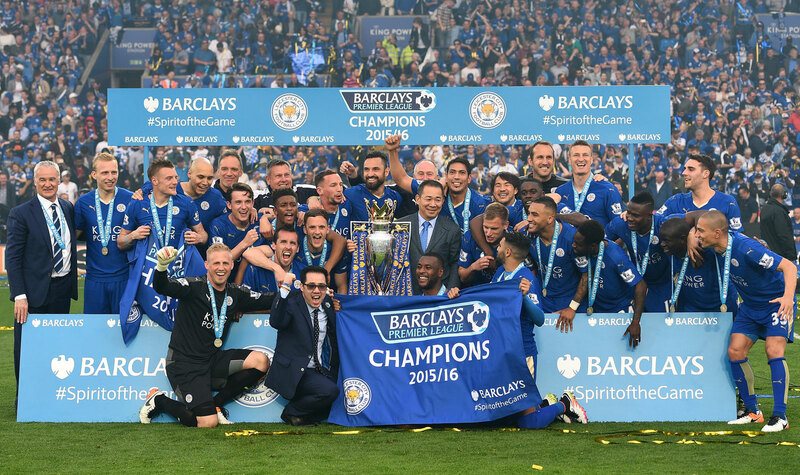 A team photo for the ages: Leicester City with its Premier League championship trophy. 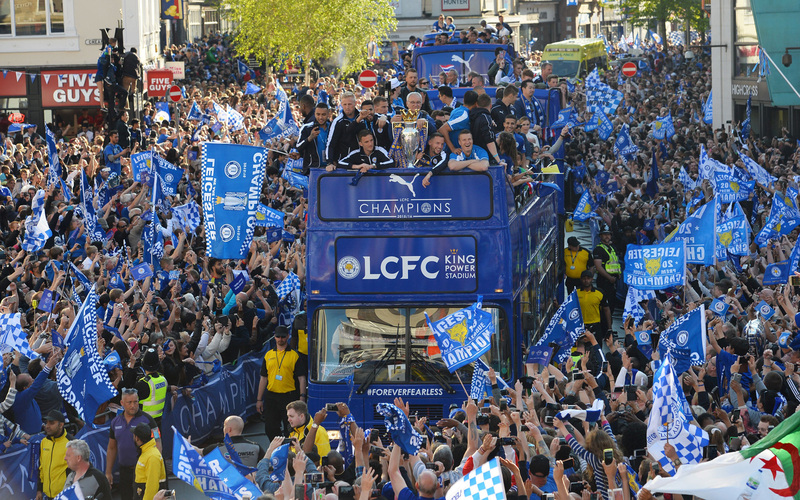 Leicester City enjoys a parade through a packed downtown, gathering with fans for one massive celebration for its title season. Leicester fans pack the streets to catch a glimpse of their title-winning heroes at the victory parade. Flanked by his star players, Leicester manager Claudio Ranieri shows off the Premier League trophy. 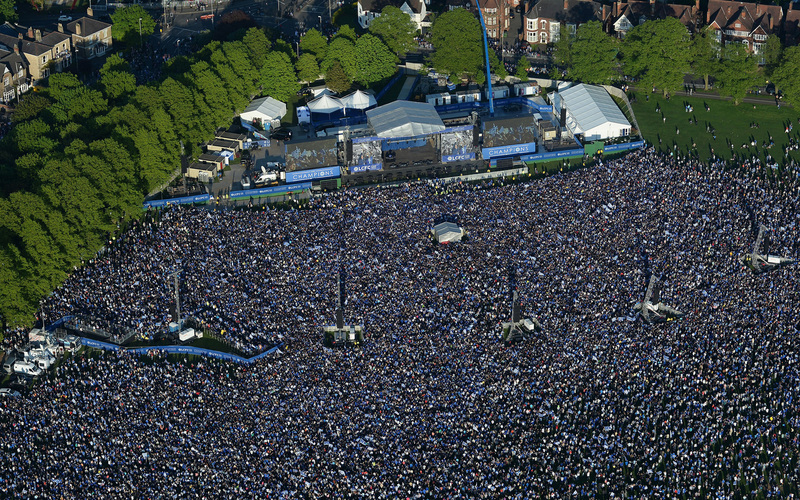 Thousands upon thousands pack Victoria Park in Leicester to celebrate Leicester City's Premier League title. Leicester’s struggles in the 2016-17 season only serve to show its title was a truly singular event. When the Italian Andea Bocelli sang for Leicester on the day it won the trophy, it was impossible to keep a dry eye. These Foxes had achieved the unthinkable.